Sorry, parents, this amazing fun zone is just for kids! Kid’s Stuff is a 15,000 square foot supervised space for children ages 0-11. 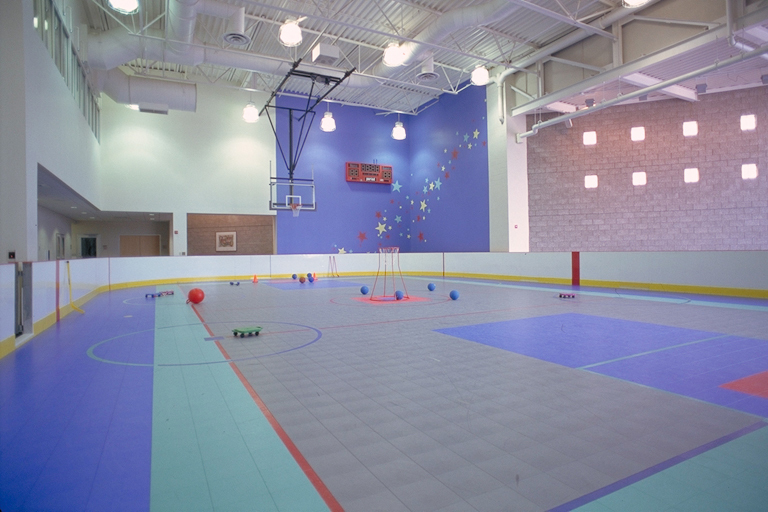 Kid’s Stuff is set up for adventurous, safe, supervised play where children can choose from fitness activities, basketball, arts and crafts, video games and more! Kid’s Stuff is for children from 0-11 years who are members of RDV Sportsplex Athletic Club or guests of members. Florida Hospital Rehab Patients may utilize Kid’s Stuff if they first obtain a guest pass. Guests are subject to normal rules, regulations and time limits. Kid’s Stuff is open from 8:00am-8:30pm Monday through Friday, and 8:00am-6:00pm on Saturday and Sunday. Children can be checked into Kid’s Stuff one time per day, for up to three hours if they are over 18 months of age. Babies under 18 months are limited to a two hour stay. How do I check my kids into Kid's Stuff? First time visitors will be asked to fill out a Child Profile Form. On this form you will list who is authorized to “pick up” your children from Kid’s Stuff. We also ask that you inform us about anything that could affect your child’s stay with us. Is your child shy or hesitant to try new activities? Is your child on medication or prone to seizures? Does your child react to ant bites, bee stings, or have other allergies? Has your child recently recovered from an injury or surgery? Share with us anything you feel might be important. You will sign your child in, and exchange their membership card for a pager. If you do not have your child’s membership card, temporary cards are available at the Service Desk, but will not be issued on a continual basis. Members may be asked to have a replacement card printed. When you sign your children in, please list each child on a separate line. You may not leave the Sportsplex grounds while your child is in Kid’s Stuff. The person picking up your child must return the assigned pager, and must be authorized on the child profile form to make the pick-up. This could take some coordinating if family members or spouses are in different areas of the club. Your membership card or driver’s license is required for pick up. Please understand that this is for the safety of all children here! If someone other than the parent/guardian is making the pick up - they must be listed on the Child Profile Form, must be at least 18 years of age, and must present a photo I.D. Members that return to Kid’s Stuff for their children without proper identification will be charged to have a new ID printed before the children can be checked out. This number is constantly changing. During anticipated busy times, we staff between 6 and 7 people upstairs, and another 1 to 2 downstairs in the gym. During quieter mid afternoon times, we may have 3 to 4 staff members on duty. All Team Members are “on call” and can be summoned to help out at any time. The Manager on Duty can also step in. Shift modifications are made when we notice a change in facility usage. Morning hours tend to be the busiest. The only requirement we have is that children be in tennis shoes (sneakers) for downstairs play. We prefer that all children wear athletic shoes. Kids will not be permitted downstairs if they are wearing crocs, sandals, flip-flops, cleats or boots. Dress your child in play clothes that allow for freedom of movement…and consider too, that paint, playdough, glitter and glue are used in the art area. Please don’t send your children in brand new clothes! Any article of clothing that might be removed should be labeled. Shoes are removed for the Bee Hive and the Inflatable Obstacle Course so it is essential that footwear be identified. Velcro sneakers are recommended for small children that don’t yet tie. PLEASE CHECK TO SEE THAT YOUR CHILD IS WEARING THE RIGHT SHOES AT CHECK-OUT! Many shoes look alike! Yes, we ask that you do call ahead if you have a baby under 12 months. If you just show up with your baby, and the infant area is already full, you may be asked to wait until a baby is checked out. We will certainly do what we can to shift staff members around to accommodate your baby, but a reservation will help us prepare from our end. Please call 407-916-2522 – even if it’s just as you are heading out of the house to come to the gym! If I am in a rush, can I drop my child off with lunch/dinner? Food is not permitted in Kid’s Stuff. You can check your child out of Kid’s Stuff and take him/her to Nature’s Table or to the Ice Den for a snack – but we do not allow food to be eaten in Kid’s Stuff. If you send your child with a water bottle or sippy cup, please make certain it is labeled! Unidentified drink containers/bottles that are left behind will be thrown away. Do you offer anything for the "older" kids? We understand that ‘big kids’ sometimes aren’t thrilled about coming to “daycare”. We’ve set aside special privileges for children 8 years and older; they can use “X BOX Room” for video gaming, legos and board games- (a great escape if they’ve had too much of the little people!) Kids eight years and older can also climb the “treadwall” during designated hours, or play soccer, basketball, floor hockey, air hockey, and more. The Kid’s Stuff areas are for children only! If you are new to the RDV Sportsplex, and need to walk your child in the first time or two, that is fine, but as a rule, Club members or visitors without children are not to be in the Kid’s Stuff areas unless they are escorted by a Team Member. There is one way in, and one way out (upstairs, at the check in desk!) All other doors are alarmed or locked. Unauthorized persons will not be permitted to enter the gated areas, or the downstairs gym area. Parents that wish to observe classes in the downstairs Activity Room need to check in at the desk, pick up a VISITOR sticker and be escorted down the stairs.